The Rockman 11 Production Note is a 64-page booklet that's currently going for hundreds of dollars on the auction block. Included as part of the now-sold-out Rockman 11 Complete Edition package (also previously sold individually via e-Capcom), the book features a wealth of concept art, unused ideas, tribute art, developer commentary, and other fun little extras. So to keep your appetite whet until you have your very own copy (or, you know, scans), here's a whole bunch of preview pages for you to ogle at. Check 'em out after the break! Among these guys are "Hurricane Man", "Mud Man/Worm Man", "Acid Man" (the red one in the botton left corner of the first image), "Polish Man", "Diesel Man", "Pile Man" (Bottom left blue guy in second image), "Neon Man", "Tundra Man" and "Blast Man"
(2nd image) "Joe-senpai: Rockman-kun... ///"
More images at this thread here. Thanks, Sky! Really cool stuff here. Maybe one day I'll obtain a booklet of my own. what's more interesting that there are other adapters for rock. even forte adapter! cross fusion anyone? and what was dr light underneath that sniper joe's picture? 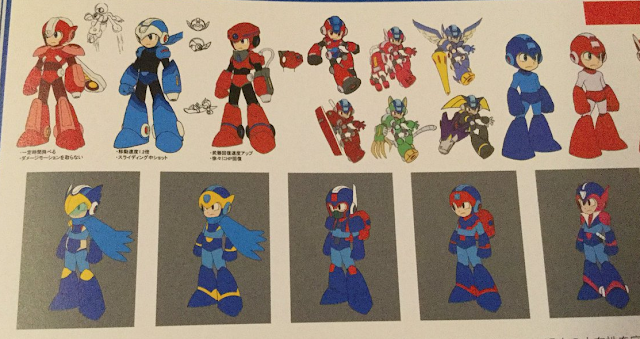 I say, it sure must be fun for the artists to "dress up" Mega Man in all these neat ideas. Hopefully, the only reason the Bass/Treble armor was scrapped, is because they're eventually planning on adding the real thing as DLC. thoses illustration are pretty neat. I responded to someone who commented on an article earlier about the idea of Mega Man having costumes like Mario Odyssey, and these all look like great candidates. Would love to see more stuff like this added to 11 or future installments. Ooh, neat! Hope the Tango and Beat adaptors come back as DLC. Looks like one of the other armour concepts is based on an unused X1 design, too.